HEADQUARTERS FOURTH BRIGADE, July 28, 1861. In obedience to the general's orders of the 20th to assume the offensive, my command was moved across Bull Run at an early hour on the 21st. I found my troops much exposed to the fire of the enemy's artillery, my front being particularly exposed to a double cross-fire as well as a direct one. 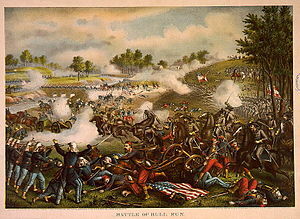 Garland's regiment, Eleventh Virginia, was placed in position to carry by assault the battery immediately in my front. McRae's regiment, Fifth North Carolina, under Lieutenant-Colonel Jones, the colonel being sick, was posted in front of the battery on my right, and with same purpose in regard to this battery. Strong bodies of skirmishers were thrown out in front of each column, with orders to lead in the assault, and at the same time to keep up a sharp fire, so as to confuse as much as possible the fire of the enemy, and thereby protect the columns, which were not to fire again before the batteries were ours. The columns were to be supported, the first by the First Virginia Regiment, under Major Skinner, the second by the Seventeenth Virginia Regiment, under Colonel Corse. The Twenty-fourth Virginia Regiment, trader Colonel Hairston, was the reserve in column of division in mass, convenient to the support of either column. Arrangements being complete, the troops were ordered to lie down and cover themselves from the artillery fire as much as possible. About an hour after my position was taken it was discovered by a reconnaissance made by Colonels Terry and Lubbock that the enemy was moving in heavy columns towards our left, the position that the general had always supposed he would take. This information was at once sent to headquarters, and I soon received orders to fall back upon my original position, the right bank of the run. Colonels Terry and Lubbock then volunteered to make a reconnaissance of the position of the enemy's batteries. They made a very gallant and complete one, and a hasty sketch of his entire left. This information was forwarded to the commanding general, with the suggestion that the batteries be taken. The general's orders were promptly issued to that effect, and I again moved across the run, but some of the troops ordered to co-operate failed to get their orders. After awaiting the movement some time, I received a peculiar order to hold my position only. In a few minutes, however, the enemy were reported routed, and I was again ordered forward. The troops were again moved across the run and advanced towards Centreville, the Fifth North Carolina Regiment being left to hold the ford. Advancing to the attack of the routed column I had the First, Eleventh, Seventeenth, and Twenty-fourth Virginia Regiments, Garnett's section of the Washington Artillery, and Whitehead's troop of cavalry. The artillery and cavalry were at once put in pursuit, followed as rapidly as possible by the infantry. 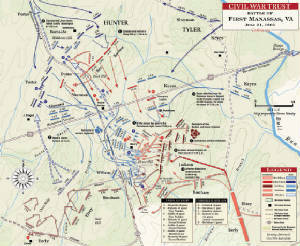 General Bonham, who was pursuing on our left, finding it difficult to advance through the fields, &c., moved his command to the road, put it in advance of mine, and the march towards Centreville was continued about a mile farther. Sight coming on, the general deemed it advisable to halt. After lying in this position about an hour the general directed that the troops should be marched back to Bull Run for water. Early next day I sent Colonel Terry forward, under the protection of Captain Whitehead's troop, to pick up stragglers, ordnance, ordnance stores, and other property that had been abandoned by the enemy. I have been too much occupied to get the names or the number of prisoners. As I had no means of taking care of them I at once sent them to headquarters Colonel Terry captured the Federal flag said to have been made, in anticipation of victory, to be hoisted over our position at Manassas. He also shot from the cupola of the court-house at Fairfax the Federal flag left there. These were also duly forwarded to the commanding general. About noon of the 22d Colonel Garland was ordered with his regiment to the late battle-ground to collect and preserve the property, &c., that had been abandoned in that direction. Colonel Garland's report and inventory of other property and stores brought in to headquarters and listed by Captain Sorrel, of my staff, and the regimental reports of killed and wounded are herewith inclosed. My command, although not actively engaged against the enemy, was under the fire of his artillery for nine hours during the day. The officers and men exhibited great coolness and patience during the time. To our kind and efficient medical officers, Surgeons Cullen, Thornhill, and Lewis, Assistant Surgeons Maury, Chalmers, and Snowden, we owe many thanks. Lieut. F. S. Armistead, acting assistant adjutant-general, and Lieut. P. T. Manning were very active and zealous. Volunteer Staff.--Colonel Riddick, assistant adjutant-general, North Carolina, was of great assistance in conveying orders, assisting in the distribution of troops, and infusing proper spirit among them. Cols. B. F. Terry and T. Lubbock were very active and energetic. When unoccupied, they repeatedly volunteered their services to make reconnaissances. They were very gallantly seconded by Capts. T. Goree and Chichester, who were also very useful in conveying orders. Capts. T. Walton and C. M. Thompson were very active and prompt in the discharge of their duties. Captain Sorrel joined me as a volunteer aide in the midst of the fight. He came into the battle as gaily as a beau, and seemed to receive orders which threw him into more exposed positions with peculiar delight.